Stronger security marks the beginning of 2019 for Emsisoft. In early January we launched Emsisoft Browser Security, our privacy conscious Chrome and Firefox browser extension that blocks access to malicious websites that distribute malware, phishing attacks, and more. Complementing Emsisoft’s proven Surf Protection feature that works on the DNS level, Emsisoft Browser Security runs in your browser’s security context and therefore can check all parts of a website’s URL/address for additional security. In our latest release, we’re happy to announce the addition of the Microsoft Edge browser version of the browser extension! In this month’s release, we’re also featuring a new label in Emsisoft Anti-Malware that shows the status of Emsisoft Browser Security. You’ll find it in the ‘Protection’ menu under ‘Surf Protection’. When navigating to the ‘Surf Protection’ settings, you’ll also notice that we have consolidated its functionality slightly. For simplicity, we merged the categories Malware, Phishing, PUP and Privacy risks to two main groups of ‘Malicious‘ and ‘Unwanted‘ hosts. 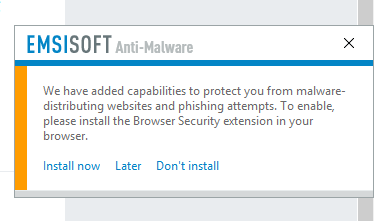 Users of alternative browsers please refer to our extended Emsisoft Browser Security User Guide for further information. New Emsisoft Browser Security extension for Microsoft Edge. New status label for Emsisoft Browser Security in ‘Surf Protection’ settings. Improved support for multiple browser user profiles. Consolidated ‘Surf Protection’ host categories. As always, so long as you have auto-updates enabled in the software, you will receive the latest version automatically during your regularly scheduled updates, which are hourly by default. New users, please download the full installer from our product pages. Have a great and well-protected day! The post New in 2019.1: Improved web browsing protection appeared first on Emsisoft | Security Blog.